In 1463-64 A.D, Ahmad khan Bhatti, who had acquired great power in the country of Sindh, and had 20,000 cavalry under him, revolted against the Governor of Multan .The Langah governor of Multan complained to Bahlul Lodi against the aggression of Ahmad Khan Bhatti and protested his incapacity to hold Multan for long unless reinforcements were sent; and that after the loss of Multan, the Punjab would be exposed to ravage. 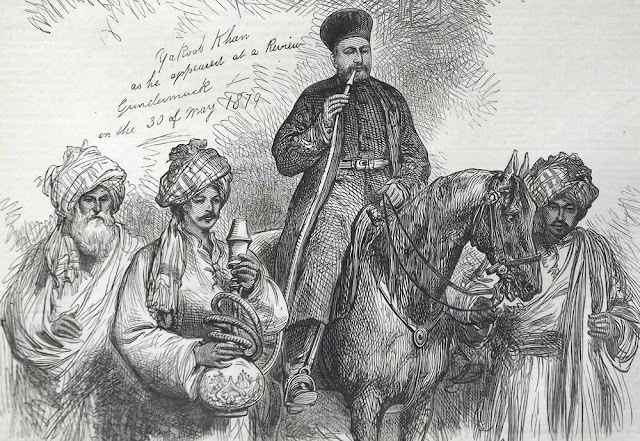 Sultan Bahlul Lodhi, , appointed 'Umar Khan, one of his chief nobles, and Prince Bayazid, to command an expedition against Ahmad Khan Bhatti, at the head of 30,000 horsemen. Lodhis moved by continued marches from Lahore till they reached Multan, where they were joined by the Governor, who acted as their guide till they reached the enemy's country. Ahmad Khan, proud in the strength and courage of his army, disregarded the Imperialists, and, not thinking it worth his while to move, sent his nephew Naurang Khan, at the head of 16,000 cavalry to oppose enemy. Naurang Khan, detached Daud Khan with 10,000 cavalry against the Imperialists, in the battle Daud Khan was slain, and his troops defeated. When those ,who had fled from the field ,informed Naurang Ehan of the disaster, he took leave in sorrow of his mistress, and arrived on the field of battle, where he displayed such valour and desperation that he clove several men of the Sultan's army in twain, and felled them from their horses. At last, a ball from a camel-gun cut him also in half, and killed him. When the news of Naurang Khan's fate reached his mistress, she put on a suit of armour, bound round her waist a gilt quiver, and put a helmet on her head, joined the army of Naurang Khan. Upon consultation with his brother, she recommended that he should send all the troops to pay their respects to her, and should give out that the prince, the son of Ahmad Khan, had arrived, in order that the enemy might be distracted, and not entertain the persuasion that they had really killed the commander of their enemy's troops. Accordingly, all the cavalry dismounted, and made their obediences, while the kettle-drums resounded with loud notes of joy. The Imperialists, not withstanding their victory, were perplexed, and in the midst of their doubts, were suddenly attacked so furiously by Ahmad Khan's army, that they were put to flight. Ahmad Khan, when he heard of the victory of his army and the salutary aid afforded by that woman, was astounded with joy ; and when he saw her arrive, decked in martial array, he praised her valor and conduct, and bestowed jewels upon her to the value of 10,000 rupees. On the other hand, Prince Bayazid, after punishing the men who fled from the field of battle, sent for another army, and two or three great nobles were dispatched to his assistance with large reinforcements. When these had all joined, they made an inroad upon Ahmad Khan's territory, and he, after many battles, was at last taken prisoner and put to death, while his country, Sindh was annexed to Delhi empire. Only Ahmad Yadgar mentions it in Tarikh i Salatin i Afghan. But there is evidence in support of Yadgar statement , a work on erotics of the 16th century in which an Afghan nobleman named Lad Khan Lodi s/o of Ahmad Khan Lodi, is described as the patron of the author (Anang Rang by Kalyan Mal) and a great warrior whose military exploits in Sindh had flooded the Indus with the tears of widows of his enemies. 2. Daudi page. 102-103 refers to Khan-i-Azam Lad Khan son of Ahmad Khan Lodi and extols his generosity in very high terms.